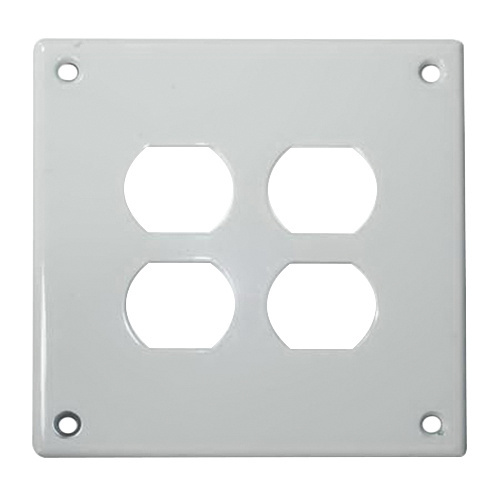 Hubbell-Wiring 2-Gang Security wallplate in white color, features 1-Piece #14 cold rolled zinc-plated steel construction with baked polyester powder enameled finish. The square receptacle has two duplex configuration. It measures 5.52-Inch x 5.52-Inch x 0.55-Inch. Receptacle is screw mountable. It withstands temperature range of -40 to 85 deg C. It offers integral bonding path to ground. It is suitable for commercial, industrial and institutional applications. Security wallplate is UL listed and CSA certified.